If one were to describe it bluntly, one could say that Railhead is Thomas the Tank Engine on steroids – a comparison Reeve isn’t unaware of when he nicknames the Network Emperor the Fat Controller. Yet Reeve’s locos aren’t crassly talking toys but engines with a Treebeard-like gravitas; large beasts with their own sensibilities and emotions (they can fall in love, too). It’s a post-AI world, where distinctions between human and non-human have become blurred: what’s the difference between a personality based on neurons and chemicals compared to one made of electrons and code? 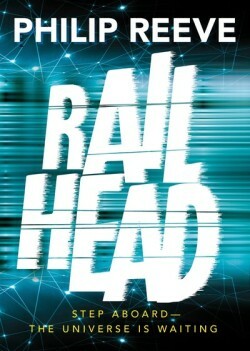 There’s much to like about Railhead. Reeve’s narrative whisks you away quickly to his imaginative universe; and even here, untethered from “Old Earth”, he manages to sneak a few references to our own world, as in Mortal Engines and Fever Crumb. I’m struck again at the ingenuity of his creation, and his ability to organically name it: there’s no real pattern to anything, yet it feels more natural than many other fictions. It’s due in part, probably, to the pilfering way he goes about it: stealing phrases and inventing names on a whim, much like languages evolve naturally. There’s never confusion about who or what he’s referring to either; even amongst a plethora of new terms, the narrative has clarity whilst remaining playful. The publication of Railhead marks the 15th year of Mortal Engines, and it’s fascinating to see how Reeve adapts to a sea of changes that have happened in technology in those intervening years. Where Mortal Engines was pistons and engines and airships, Railhead is artificial intelligences, dataseas and drones. Reeve nimbly adapts himself to new technologies and takes plausible leaps in such a way that I suspect even in five, or ten, years’ time, the story won’t feel outmoded. Likewise, similarities can be seen in his exploration of what it means to be artificially intelligent; in the Mortal Engines Quartet, Shrike embodied non-human sentience. In Railhead, it’s the Motoriks; humanoid robots created to serve. Railhead may not reach the Shakespearean grandeur of Mortal Engines (few things can), but Reeve’s second foray into the world of science/speculative fiction marks an admirable achievement. A lighter, perhaps more fun story, Railhead nonetheless opens up a thrilling and fantastic world that defies many modern sci-fi tropes. An excellent adventure, Railhead leaves me with high hopes for its future, grandly laid out in the final chapters of the novel.